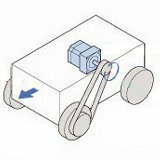 Motor control via network communication can detect the status of the motor directly by data. 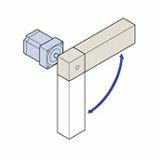 This results in a shorter development period and increased reliability and maintainability of the equipment. By expanding the network compatible product lineup, Oriental Motor meets diversifying network environments of factory automation. 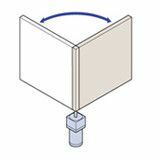 Simple wiring achieves space saving for wiring and smaller equipment size. 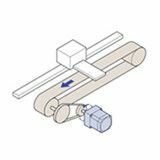 Transmission distance can be extended making wiring route design easier and enables products to be positioned in appropriate locations. Simple wiring achieves a reduction in man-hours for the wiring process and in the cost of wiring. Operating status is monitred by product input/output information, alarm, etc. This achieves improed maintainability via the system. 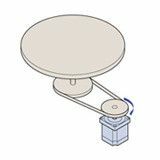 Simple wiring makes wiring and checking process easier when replacing the product. 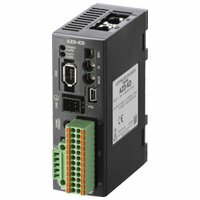 A multi-axis controller that supports EtherCAT communication.Compatible with the CiA402 drive profile. 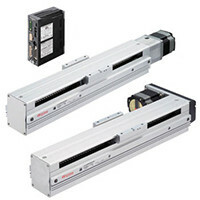 It can be connected to the AZ Series DC input stepper motors and electric actuators. EtherCAT is an Ethernet (IEEE802.3)-compliant, open, high-speed industrial network system. Modbus is the open field network with Modbus Protocol installed. Modbus is used widely in field of factory and process automation because its protocol specification is open to the public and it is very simple. CC-Link (Control&Communication Link) is the open field network promoted by CC-Link Partner Association. CC-Link is a registered trademark of CC-LINK Partner Association. MECHATOLINK-II and MECHATROLINK-III are motion networks promoted by MECHATROLINK Members Association. MECHATROLINK is a registered trademark of MECHATROLINK Members Association. SSCNETIII/H is an open field network promoted by Mitsubishi Electric Corporation. SSCNETIII/H is a registered trademark of Mitsubishi Electric Corporation.. 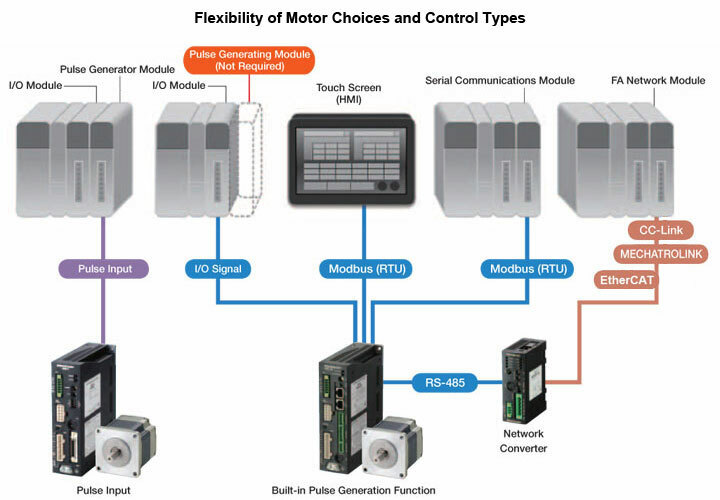 The functions of a positioning module (pulse generator) are built into the driver allowing it to be connected directly to a controller or PLC to configure an operating system with I/O. 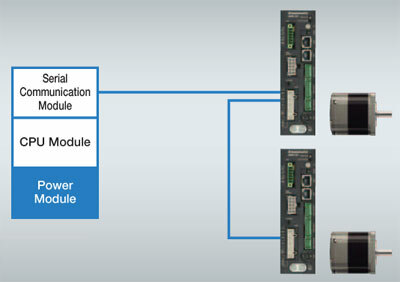 Since no positioning module is required on the PLC side, space is saved and the system is simplified. Operating data, parameter settings or operation commands can be input via RS-485 communication. A maximum of 31 drivers can be connected to one serial communication module. There is also a function for simultaneously starting multiple axis. The protocol is compatible with Modbus (RTU) and can be connected to a touch screen (HMI), PC, etc. By using a network converter (sold separately), CC-link or MECHATROLINK communication are possible. Operating data, parameter settings or operation commands can be easily input. Since operating data is set in the driver, the motor can start and stop with hand switches. 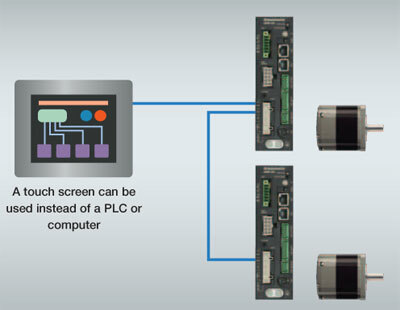 Easy control without the use of a PLC is possible. Operating data is set in the driver, allowing it to be connected directly to a PLC to select the motion profile. 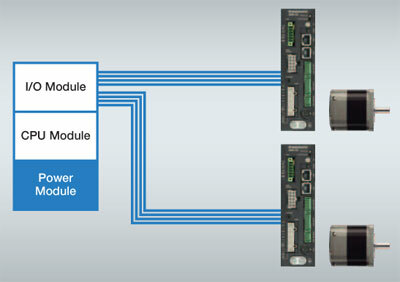 Since no positioning module is require on the PLC side, space is saved and the system is simplified. 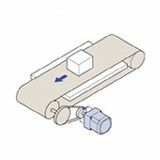 The motor normally starts and stops via I/O, and Modbus (RTU) communication is used when setting the alarm and operating data. Setting changes as well as monitor and alarm displays are performed on the touch screen. If multiple configurations exist, parameters can be entered on the touch screen, reducing the burden of combining programs or sequences. 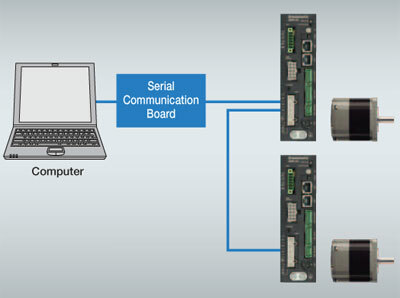 Operating data, parameter settings or operation commands can be input via RS-485 communication. A maximum of 31 drivers can be connected to one serial communication module. There is also a group sending function for simultaneously starting multiple axis. The protocol is compatible with Modbus (RTU) and can be easily controlled via PLC, etc. Operating data, parameter settings or operation commands can be input by inserting it into an RS-485 communication board on a PC. No changes are required to your serial communications board. 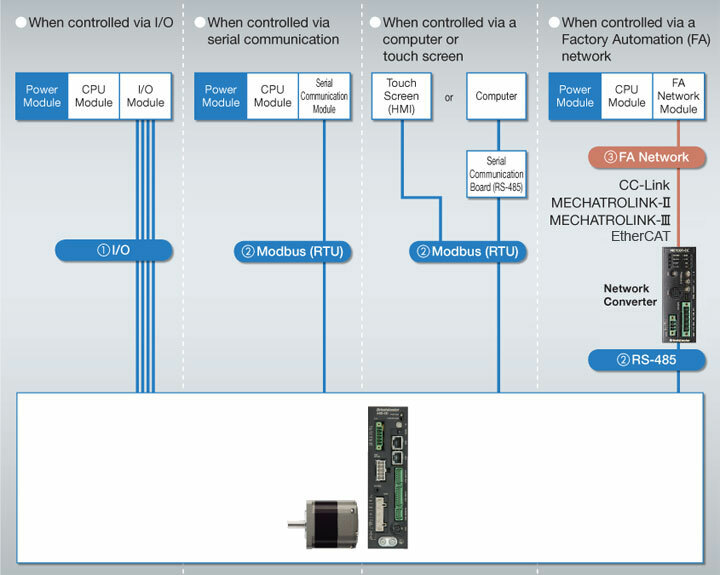 By using Modbus (RTU) communication, connection can be made directly to a touch screen (HMI). Operating data, parameter settings, alarm history, test drive, etc. 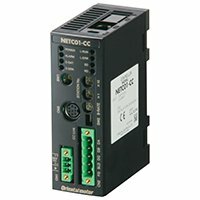 can be used, allowing the motor to be controlled without the added cost of a PLC or computer. 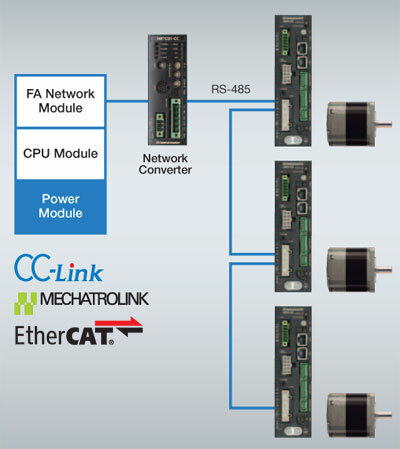 By using a network converter (sold separately), CC-link communication, MECHATROLINK communication and EtherCat communication are possible. Operating data, parameter settings or operation commands can be input via various types of communication. 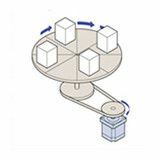 Since it can flexibly accommodate the networks specified by the end user, design time is shortened. 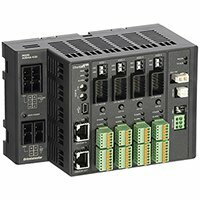 The burden on the programmable master controller is reduced and costs are lowered when multiple axis are used. 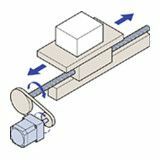 Compatible with various networks, allows for multiple axis or additional axis if needed. 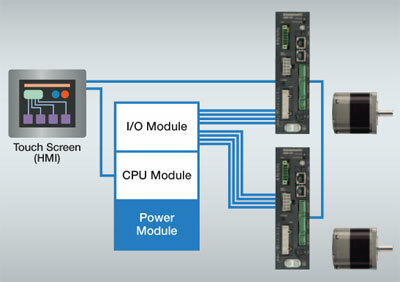 This function simultaneously starts multiple axis in Modbus (RTU) communication and the Factory Automation (FA) network. 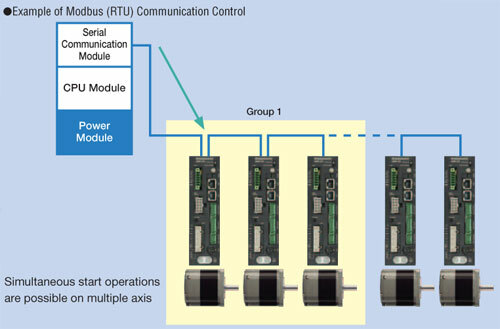 Multiple drivers are grouped together, and when operation commands are sent to that group's parent, all of the drivers belonging to the same group are operated. 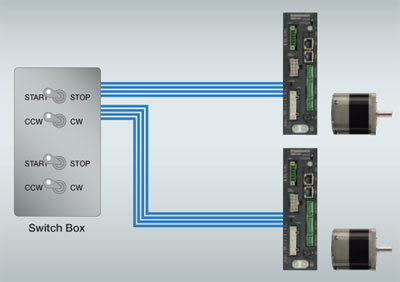 Factory Automation (FA) network control: Only simultaneous starting.